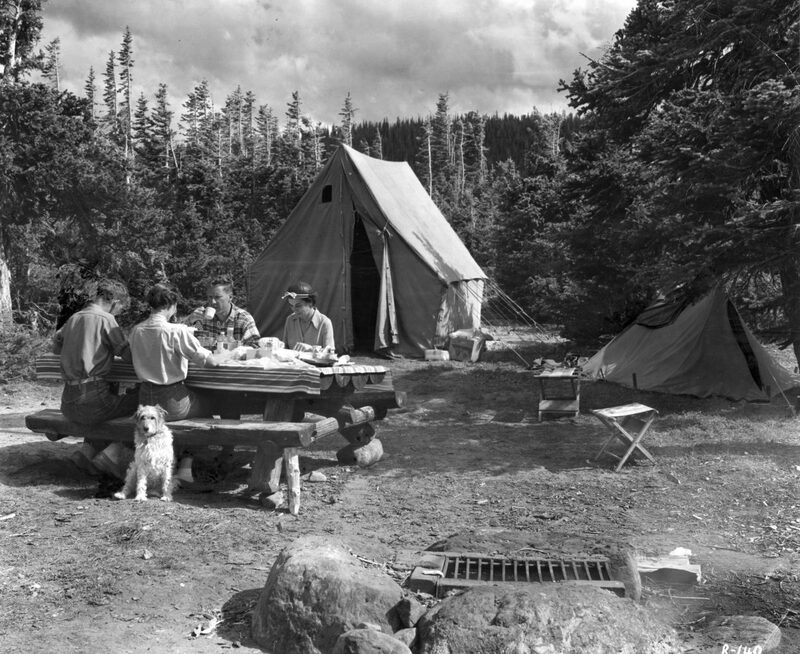 A family enjoys a meal at one of Colorado’s campgrounds in 1955. Photograph courtesy of The Denver Post. Undoubtedly, with its “Frontier” status still intact by Bureau of Land Management standards, Northwest Colorado is an ideal region to enjoy a true camping experience. Whether you prefer tent camping, car camping, backpacking or a more regal experience in a motor home, our area offers a variety of camping venues from lush high mountain valley camps to the arid solitude of desert camps. Although the accoutrements of camping have changed throughout the years, some elements never change. Bugs, lumpy sleeping bags, star-spangled nights and brisk mornings are all part of sleeping outdoors in Colorado. Even when early pioneering life must have closely resembled camping itself, those hardy people headed up to the mountains with their tents to fish, gather berries, cut firewood and just revel in the beauty of their new homeland. Despite the considerable time it took to get up on Black Mountain with a team and wagon over rough roads that weren’t much more than a dirt track, the adventurers made frequent camping trips to the high country. And those intrepid outdoor enthusiasts didn’t neglect the time-honored tradition of the family photograph to document their campouts in the serene wilderness. Much like the “selfies” of today, those early photographs document family groups posed to commemorate their trek to the pristine forestlands. The Museum of Northwest Colorado has a substantial group of photographic images showing camping trips in our area spanning various decades. To celebrate the incredible wilderness experience we enjoy here in Colorado, the museum is hosting an exhibit of photographs by Colorado’s premier photographer, John Fielder. This exhibit, now on display on the museum’s main level, also commemorates the 50th anniversary of the signing of the Federal Wilderness Preservation Act in 1964. Moffat County Commissioner Sam Steele was present at the signing and was photographed shaking hands with President Lyndon B. Johnson after the ceremony. That photograph and the pen used to sign the bill by President Johnson, along with Fielder’s outstanding images, will be on display at the museum until July 12. While there, be sure to take a look at the camping exhibit, featuring some vintage camping gear used in our area. The museum is open Mondays through Saturdays with free admission. For more information, visit http://www.museumnwco.org or call the museum at 970-824-6360.